Dependency Softwares Currently Installed in GenAp CVMFS as of 2014-Jan-30. GenAp CVMFS Stratums and Squid Monitoring. Install softwares securely in one location and have them propagated to the remote GenAp participating sites without worrying any prerequisites, nor linux distribution and release level. CVMFS stands for CERN virtual Machine File System. It is a file system hosted on standard web servers and accessed by clients using FUSE (file system in userspace). Software can be installed in one location and cached on demand anywhere using CVMFS. Originally developed for the LHC (Large Hadron Collider) experiments to optimally deliver software for VM images and as a replacement for different software installation areas at many distributed locations. Designed to deliver software in a fast, scalable and reliable fashion. Hundreds of compute sites using CVMFS over the last 2 to 3 years with success. Maintain one copy of the files for multiple sites. Softwares need not to be embedded in the original image or virtual machine. Virtual machine images and softwares can be maintained separately. Files are fetched using standard http protocol from the server. No additional ports are required to be opened in most environment. Files are downloaded locally and cached on demand on CVMFS client in order to reduce network traffic. 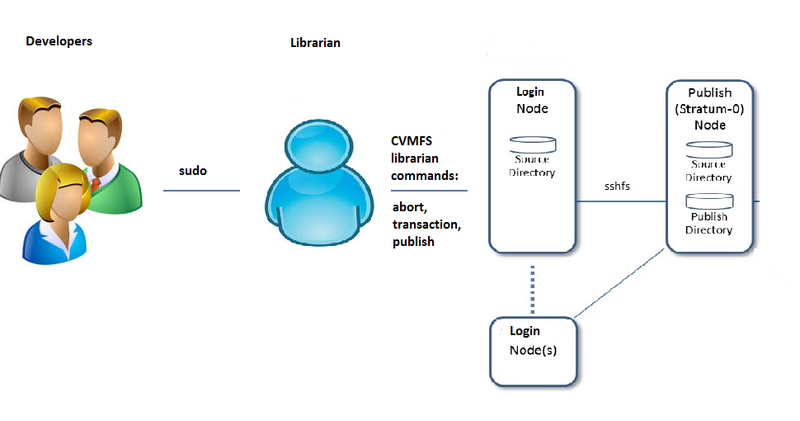 The CVMFS structure is highly scalable and redundant. Remote squid can be used as a failover cache server for local CVMFS client. CVMFS clients are only working on a read-only copy of the file on the server. Changes on the files are not propagated until a commit has been issued. Files are encrypted using RSA. Software and prerequisites can be installed in CVMFS in order to reduce remote software administration. Software can be installed in one location and propagated to multiple sites. Software versioning is reinforced across multiple sites. 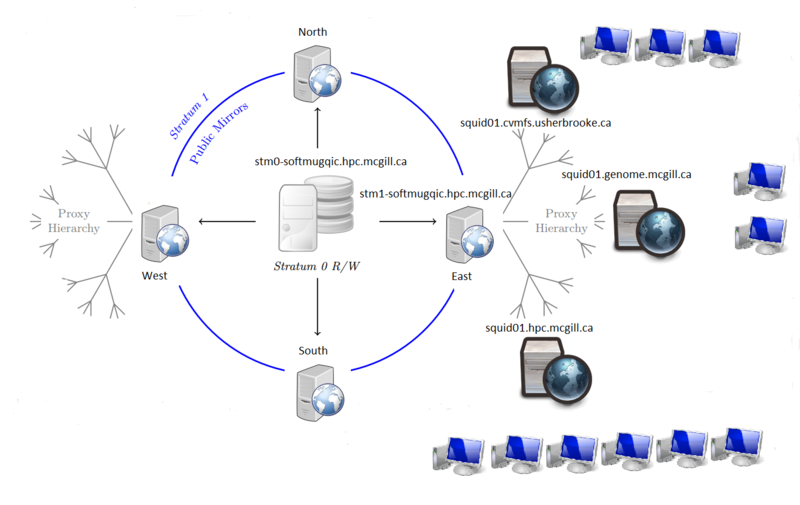 Files are injected by an application software maintainer / librarian using dedicated Compute Canada Guillimin login node (guillimin1.clumeq.ca) through sshfs using libuser account. 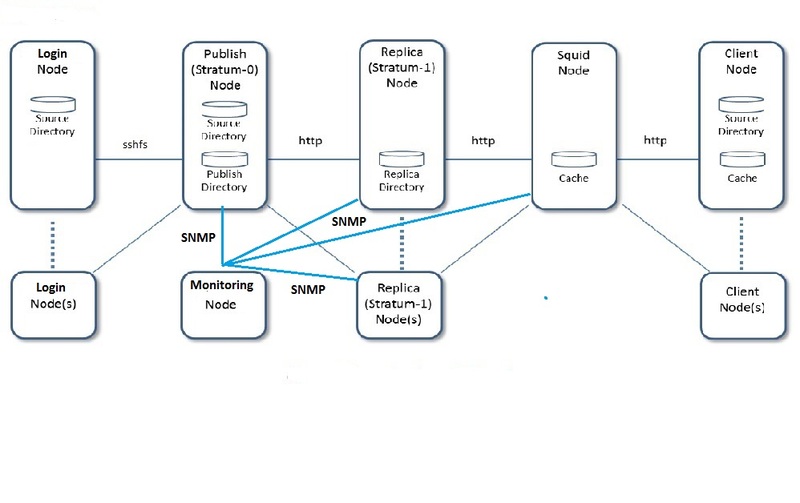 The committed change will propagate the injected files from stratum-0 to stratum-1 and then only cached to squid and to the client node (compute node) on demand. Our GenAp CVMFS implementation focus on flexibility of code injecting without giving shell access to Stratum-0 and at the same time be able to execute CVMFS librarian commands. Multiple developers can test programs on the dedicated login node. Using a sudo privileged command to switch from developer to CVMFS librarian, the CVMFS librarian commands can be executed. Only one single librarian session is allowed. This will in turn guaranteed the right content being published. GenAp CVMFS participating sites do not have to use same linux distribution nor the same release level because softwares and other prerequisites are installed in CVMFS. Hence, no softwares are local OS dependent. No additional tasks shall be performed on the remote site except for installing the CVMFS client software. Replication between Stratums are being monitored just in case if they are out of sync and so is Squid cache size since having an optimal size can reduce unnecessary files fetching due to files being swapped out. Cache size at the squid level should be about 500Gb. Cache size at the CVMFS client level should be about 30Gb. Current sites: Mcgill (Guillimin), Genome Innovation Centre (Abacus), Sherbrooke (Mammoth). The version of CVMFS used in the demo is 2.1.19. KVM is required to load Stratum-0, Stratum-1 and Squid virtual machines. A CVMFS client has to be provided on your end to complete the demo. The quick demo is used to demonstrate file distribution from Stratum-0 to CVMFS client using the VMs provided for Stratum-0, Stratum-1, Squid and CVMFS client configuration. KVM host: Perform a hard reset on the VM. Your VM will now boot all the way with the new root password that you have set. KVM guest ns-vm32: check test.domain to see if the CVMFS filesystem has been created properly. KVM guest ns-vm32: Inject a file for testing. KVM guest ns-vm33: add a replication to ns-vm33 and take a snapshot of the content on ns-vm32. make sure ns-vm32 and ns-vm33 can be reached. Make sure autofs will start automatically.